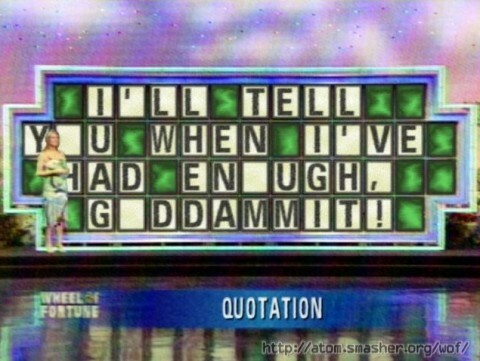 LAST WEEK, the always delightful Pat Sajak revealed that early in his career as genial host of “Wheel of Fortune,” he and Vanna would occasionally knock back a few during taping breaks and return to their duties somewhat buzzed. Must have been a slow news week, because like you, I heard about it everywhere, and most of the coverage was ridiculously sensationalized. Fact is, if a big-time host actually came across as drunk on a game show, the episodes would have been on YouTube a long time ago. As it turns out, however, my dear, sweet, hoarding Nana Parsnips has been a fan of Mr. Sajak for years, and has (of course!) obsessively taped all his shows from his first episode onward. I needed only mention this current story to her before she dived right into her hoard and, paddling her way down through old newspapers and desiccated raccoons, quickly resurfaced with a handful of Betamax tapes in her arthritic claws. I’d get into all kinds of copyright trouble uploading the videos to YouTube, so instead, I offer you some screen grabs. Did all this drinking spill over into the show? You be the judge. 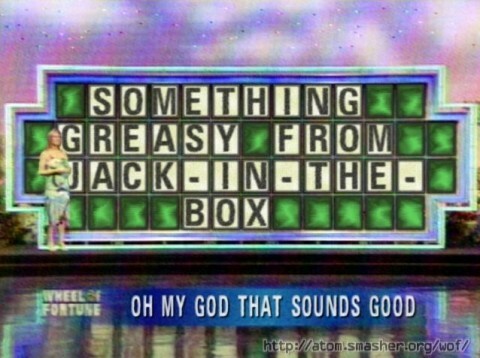 It’s a Prize Puzzle! You’re going to Passages in Malibu! Like you and I, Pat & Vanna know to hit the drive-thru after some hard drinking! 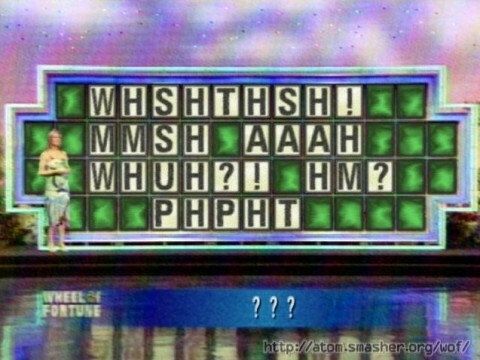 Apparently this Bonus Round puzzle was inspired by the noises Pat made when Merv tried rousing him from sleeping it off on the wheel. We of course thank http://atom.smasher.org/wof/ for the use of their handy Wheel of Fortune puzzle generator, where you can go and create your own Wheel of Fortune puzzle pictures, none of them half as funny as the ones I came up with, which is saying something because the ones I came up with aren’t really all that hilarious. …And what’s even more delightful than this Pat-&-Vanna-drunk story from last week? 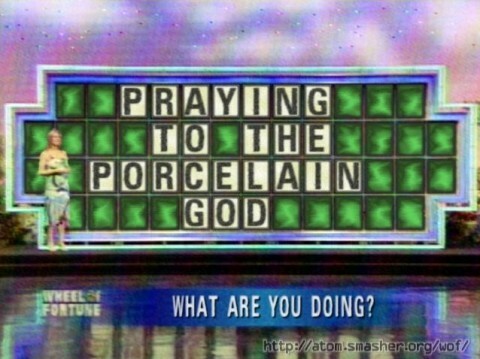 The “Occupy Wheel” joke that Pat made at the end of a show during the recent “Pure Paradise” theme week. That man should have his own late-night talk show. Again. Posted by Ted on January 30, 2012, 5:33 AM.